Late last week, ProPakistani reported that Xiaomi is gearing up to launch the Mi 6 and a bunch of other eco products in the Pakistani market. Mi Pakistan has been heavily teasing the launch of their flagship on Facebook for the past few weeks. Today, the flagship phone has been officially released along with the price and variant details. The Xiaomi Mi 6 comes with a 5.15-inch display which is 1080p. Construction wise, there’s glass on the front and a metal frame all around the device. Xiaomi claims that the body is manufactured in 12 days using 40 different processes. On the hardware side of things, you get Qualcomm’s latest and greatest, the Snapdragon 835. For your multitasking needs, there’s 6GB of RAM in tow. Storage is 64GB though there is no microSD card slot available. As far as the photography is concerned, you get dual 12MP cameras. One of which is a wide angle lens while the other is a telephoto lens. You also get 4-phase optical image stabilization, phase detection autofocus and a dual LED flash. Powering everything is a hefty 3,350 mAh battery which also supports Qualcomm Quick Charge 4.0. Xiaomi Mi 6 has been priced at Rs. 46,999 for the 6GB+64GB variant. While the price is much higher than what we’ve seen in China, Mi 6 still comes in as the least expensive modern flagship in Pakistan. There’s no word on whether the 128GB variant will see its way to Pakistan. You can get the Mi 6 from the company’s official website. I am not getting push notifications on my Chrome Browser by ProPakistani from few weeks. All other websites are working fine. Dont know why but I am not getting from ProPakistani. But I am getting from other websites regularly. Mind your language. I don’t know who you are. I promise I find you and you sorry for commenting. Sorry say now. Its official price in china is 360$. By converting it into PKR it becomes 38K. If you add 4000 custom import duty and taxes, it costs 42K to Smart Link Technologies. Now SLT is also here to earn some money and so are retailers. That extra 5000 is profit of SLT, Wholesalers and Retailers. Redmi Note 4 and Redmi 4X ki toh abhi tak nai aai bhai Mi 6 ki kaisay aa jaye gi? Currently Xiaomi’s focus is on Punjab. Every body knows xiaomi here now. Even they made 2 flagship stores only in Faisalabad. No body knew OPPO in their 1st year as well. Aur shayed aap marketing nahin jantay. Qeemtein tabhi kam ki jati hyn jab koi lene wala na ho. 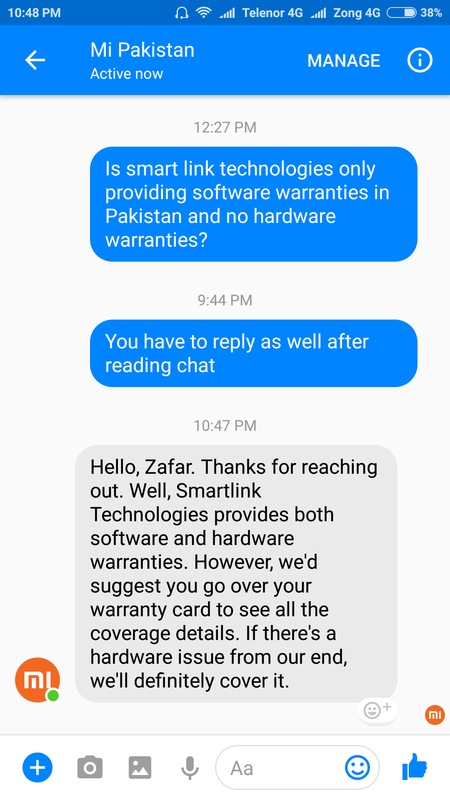 Jab current price pe handset bik raha hai toh unhyn pagal kuttay ne kaata hai jo price kam karein gay. I heard that if you ship from AliExpress as a gift, no tax will be deducted rather you can buy at the original price? Is it true? No. Mobile phones are excluded on this Gift clause. What are tax % on laptop and mobile phones? Can you guide me? 1500 straight on all WiFi devices. Remaining tax calculated on price and features. Now we can order MI6 from Aliexpress.? Don’t we need NOC from PTA. Smart Link Technologies is not providing any warranty for Xiaomi hardware issues they are only providing warranty for software issues. Well here is slt official response. i visited zong office in blue area isb few weeks ago. the specs card for mi note 4 had “warranty: software only” written on it. i asked the sales person and he confirmed that warranty is for software, not hardware. so i did not buy it. if company/distributor is not confident of its quality and reliability then why should i be? also mi’s redmi series in india has dead pixel and mic issue. you can search for it on google. it is quite possible the same issue also exists here that’s why they are not giving warranty for hardware. 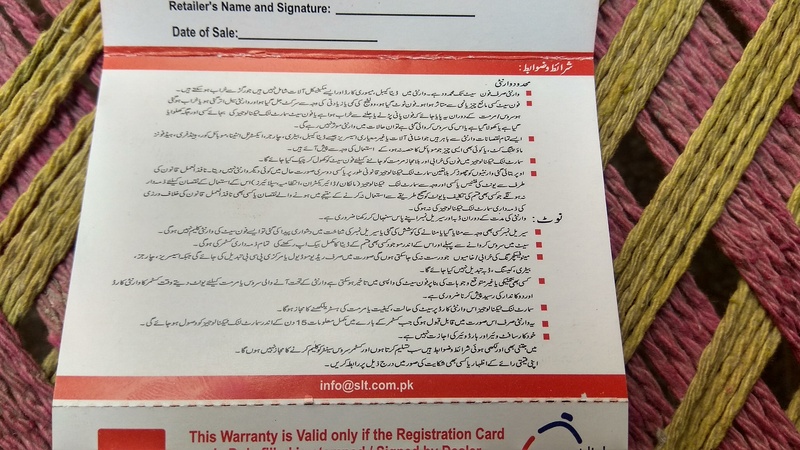 can someone post a picture of terms and conditions on their warranty card. I dont know what happened to you but there is nothing written like this on my warranty card. 47K is a reasonable price if you compare features to other flagship devices and their price. Second if you import Mi 6 from chinese websites like Aliexpress and Banggood it also cost around 45K. 3000-4000 custom will also add. So import cost will be more than Pakistani price. Jab sasta hoga tab len gay. Specs are great but having no SD card slot is a big negative.